SUMMARY: WHO IS MAJOR X? A mysterious new player enters the Marvel Universe and the X-Men are in his crosshairs! What is his mission and how can the man known as Cable hope to stop him? Writer/artist Rob Liefeld introduces a new wrinkle in the saga of Marvel’s Mightiest Mutants! COMMENTS: There is a flavor to a Rob Liefled comic. You either like that flavor or you don’t. Much like pistachios. A Rob Liefled comic is almost like an Arnold Schwarzenegger movie, it’s not for everyone. However, if you like big action and high adrenaline pacing you are in for a treat. Despite the summary text from Marvel, this is not a mystery they tell you who Major X is in the first issue. 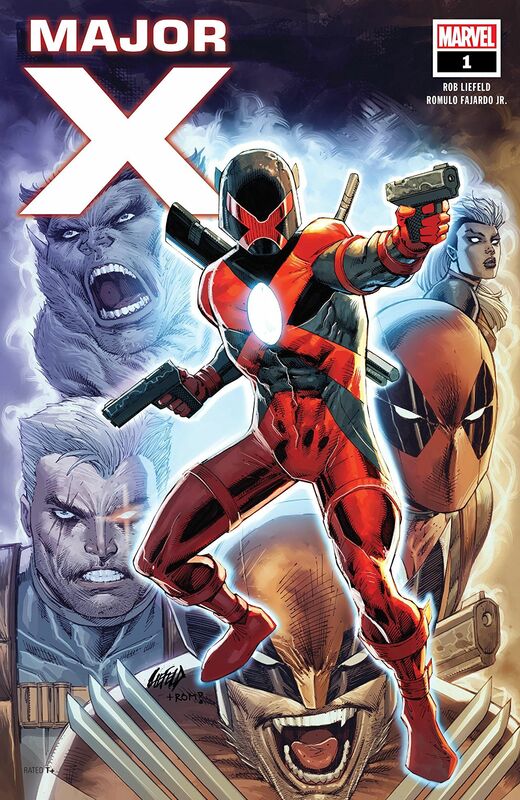 Marvel is doing a big best of the past 80 years at Marvel and Major X is one of the best examples of this. Major X is set as a part of Liefled’s original New Mutants/X-Force run. If you liked those comics and miss that style this is 100% what you have been craving, it is perfect! If you didn’t like Liefeld’s early work I can’t even understand why you would pick up this comic unless you are looking for something to complain about. In this issue, you have a miss understanding that leads to a fight scene, you get a Wolverine appearance with more fighting, you get a familiar but different version of a beloved second string X-Man and you are given the motivation behind the mini-series. It is everything you ever wanted from a 90s comic. If you’re a Liefled fan who wanted to know what it would have looked liked if he stayed on X-Force and didn’t form Image Comics 25 years ago this is exactly everything you were hoping for in a comics. A perfect 5-star experience! If you hated Liefled, either now or then this is also the perfect 5-star experience because you can hate it just as much all over again. In conclusion, everyone knows what to expect from this comic prior to publication, the execution is either wonderful or horrible based on your preconceived notions. Either way this comic delivers that Liefled experience 100% even 25 years later without missing a beat and introduces new characters and ideas into the X-Man pantheon.